Did you know that Greenspot Salad Company provides San Diego with high-quality catering services? It’s true! What better way to put a delicious twist on your next meeting, seminar or other work-related event with catering from Greenspot Salad Company? Head on over to the Catering section of our website to find out more details about our San Diego salad bar catering services. Work events can sometimes be challenging. Whether if it’s trying to engage with your audience, trying to make things interesting, or ensuring that you get people to actually show up to your event, there are many different things that need to happen to ensure that your event is a success. Providing your employees with high-quality catering, however, can make them stand apart from the everyday event and leave an impression on your attendees. Hiring Greenspot Salads Company to cater your next work meeting or event is a great way to ensure both of these things. Here are a few reasons as to why you should have Greenspot Salad Company cater your next work event. How many times have you been to a meeting, seminar or other work-related event, only to find the same boring catering spread that you’ve experienced time and time again? You can’t get any more common or predictable than by choosing a sandwich chain to cater your next work meeting or seminar. While sandwiches can have a variety of toppings, at the end of the day, a sandwich is a sandwich. Surely you can do better than that, and Greenspot Salad Company is here to provide you with the perfect catering spread for your next work meeting or seminar. Choose from a wide variety of salads, wraps, soups and sides to make your next work meeting go from boring to delicious in an instant! With many people making changes in their lifestyles and diets to eat healthier and avoid things like preservatives and other additives, many catering options leave people with few options by way of things that they can actually eat. Sandwiches or other options leave your employees either having to compromise their diets or not eat at all, neither of which is a desirable option. 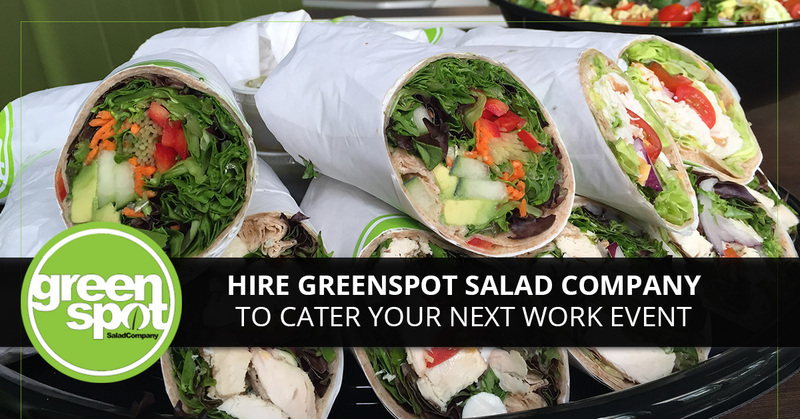 By getting Greenspot Salad Company to cater your next work event, you will be providing both you and your employees with a fresh and healthy alternative. Our delicious catering items are all natural and contain no high fructose corn syrup, antibiotics, hormones, or ingredients that we cannot pronounce ourselves. Whenever possible we try to source local and organic ingredients within reason. The result is a lunch that is natural, better for you, and incredibly delicious. We get it— sometimes it’s just easier to go with the old standby and get catering from the same place that you always get it from. Surely, you’ve got a busy schedule and need to focus on work-related issues, but how does this reflect on you as an employer? By providing your employees with less-than-stellar catering at your next meeting or other work related event, it can give them a negative impression of you as an employer. By doing this, it can potentially make it seem like you don’t care enough about your employees to put some effort into providing them with a quality lunch. By choosing Greenspot Salad Company to cater your next work event, however, our wide selection of all natural and super fresh salads and wraps will show your employees that you care for them and want to provide them with more than just average catering. Those are just a few reasons as to how Greenspot Salad Company can make your next meeting, seminar or other work-related event stand apart from the others. It’s important to engage with your audience or employees, and by providing them with fresh salads, wraps and soups from Greenspot Salad Company, you’ll not only make an impression on them, it’s likely that they’ll be more engaged and receptive towards the informational aspect of the event. At Greenspot Salads, we are committed to providing San Diego with the freshest and most delicious salad bar around, using the best ingredients to create delicious salads, wraps and soups. Visit one of our two San Diego salad bars today – in Sorrento Valley and 4S Ranch.